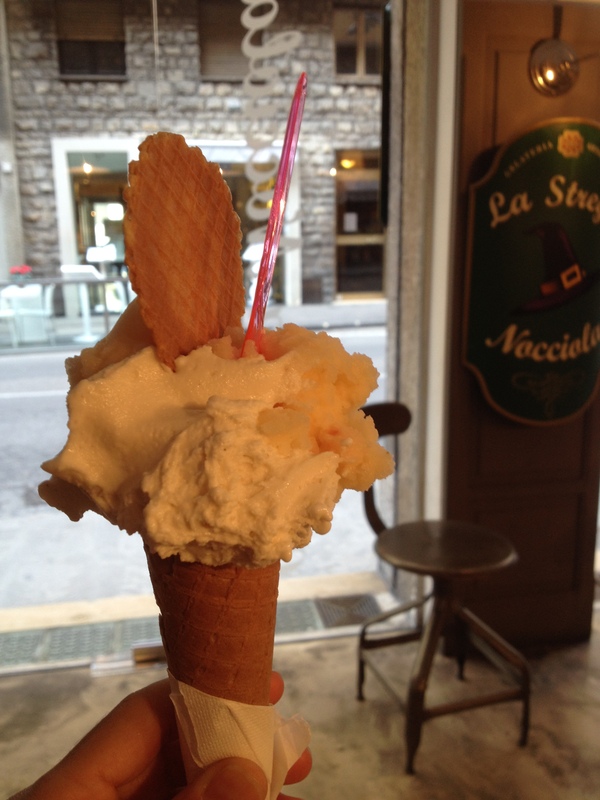 A person can’t be in Italy without licking up a gelato at least once a week…or once a day. Please tell me how one can stay fit on two scoops-in a cone-per day…not including bread, pizza and pasta? I’ve been told the trick is to walk it off. Walk, walk, walk. La Strega Nocciola translates to the Hazelnut Witch…or Hazel the Witch. 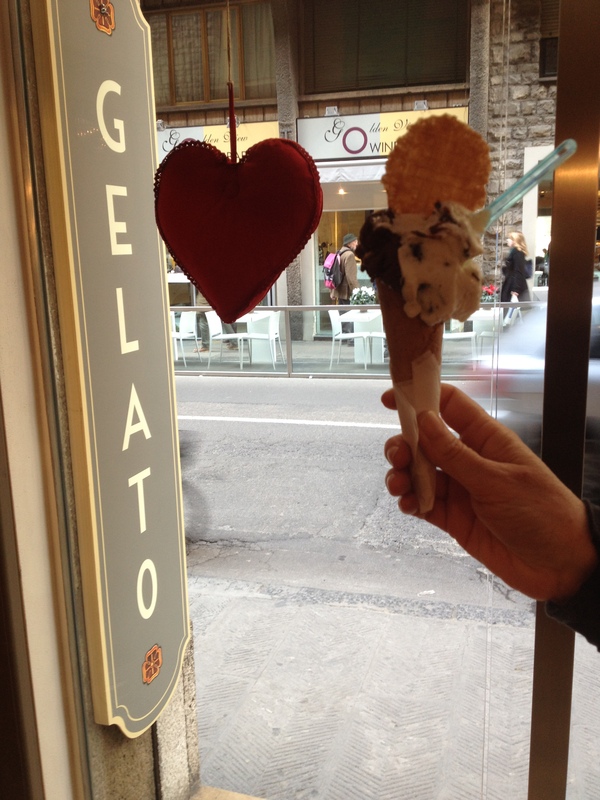 This is where a friend took me for lovely gelato. My favorite flavors are Lavanda (Lavender) and Pompelmo (Grapefruit). Uma pessoa nao pode viver na Italia sem experimentar um gelato por semana…ou, em certos casos, um por dia. Pode estar fazendo o maior frio, e eu posso estar vestida de pés a cabeça, casaco, cachicol, e luvas…mas a tentaçao sempre vence. Agora me diz, como é que a pessoa pode manter a forma enquanto prova duas bolas, no cone, ao dia? Isto nao inclue o pão, a pizza e a pasta que tambem fazem parte do atual regime. Os Italianos me dizem que o segredo é caminhar muito. A Strega Nocciola (A Bruxa de Avelã) é uma gelateria que oferece sabores naturais. Os meus favoritos são Lavanda e Toronja. The past several weeks have gone by so quickly. I’m two months into the Italian Baking and Pastries Program. I wish I could share all the things I learned in the first class, Breads of Italy. But if I were to post every single bread we learned to bake in class…there would be more than 50 new posts. Yes, that’s right! We prepared and TASTED at least that many breads during the 3-week course taught by Chef Fabio Ugoletti. The course was held Monday thru Friday from 6:00 p.m. – 8:30 p.m. You can imagine what happens to the belly when a person eats that much bread at night, and over three consecutive weeks. Yes, my belly formed a small gluten-containing layer (michelin tire, not michelin star). The extra layer weighs eight pounds. I can’t say I’m a professional chef because I’m not. Therefore, I’m not the best judge of food. But, because of my career background in higher education and because I’ve spent nearly 35 years of my 40 something enrolled in some sort of school (forever student) I can say with 100% confidence: “I know a good teacher when I see one”. Chef Fabio Ugoletti deserves the complement because he embodies all the qualities of a good teacher. He was wise with our short class time. We had only 2.5 hours for lecture, prepping and baking and Chef Fabio was able to fit in so much useful information during that time. Class always began on time. He was organized and pro-active and he ensured that we had all the ingredients we needed to bake our breads…as well as all the accompanying foods that are typically eaten with each bread. Each class began with a lecture and explanation of the breads we would bake, their history in Italy and tips and tricks for preparation. Afterwards, Chef Fabio wrote each recipe ingredient on a large whiteboard and we proceeded to work. He was attentive and answered all our questions. He knew his stuff but was humble about it. My classmates all agreed on this: He was the most humble chef we’ve ever met. All those qualities were great. But the most spectacular quality about Chef Fabio was the contagious enthusiasm with which he taught each lesson. If Chef Fabio ever had a bad day, we were unaware because he always taught with energy…and gusto! Gusto means pleasure in Italian. I recorded several videos during class. The videos are loaded with happy moments. For example, there’s one video where Chef Fabio says: “Don’t be shy with the cheese. Ohhhh yes!” He says this while he grabs handfuls of mozzarella cheese and pours it over a bread that we later rolled and baked. There’s another video where Chef Fabio says: “A good chef has to taste the food. That’s why I look like this. Because I like to taste the food”. He points and references his belly. Chef Fabio was present for every moment of class. I remember him passing each station to check our dough and complimenting the good dough. Sometimes he’d grab a chunk of dough and plop it into his mouth. First time I’ve seen someone walk around the kitchen chewing on bread dough. I think you get the picture. The Breads of Italy class was loads of fun. Instead of starting with a recipe, I’ll provide an overview of breads in Italy. And, rather than re-writing a whole piece for this blog, I will instead post the research paper I wrote for Chef Fabio’s class. Much of the information was taken from class lectures. Some facts also come from historical records regarding breads and other bits were taken from our class textbook, “On Baking” as well as cooking blogs. Included in the paper is a map of Italy labeled with major breads and their origins. Get ready to learn about breads of Italy. The first post is just the beginning! I love all animals. It’s difficult to explain the bond I feel with animals but the feeling is deep…and it is mutual. In the presence of animals I am one with nature and I know they feel the same way about me. Someday I’d like to run an animal sanctuary for lost, injured or abandoned animals. Until then, I will try to learn as much as I can about them and will do everything possible to preserve them on our earth. During my first few weeks in Florence I had the pleasure of unknowingly hosting a pet. On one very cold night…during a deep and beautiful sleep, I was awakened by a stinging pain on my left arm. I remember rubbing my arm and thinking, “what a powerful mosquito”. I assumed the bite was from a mosquito because included in our university orientation materials was a section on essential items. The text mentioned we should have mosquito repellent because mosquitoes are common even in the winter. I had heard a mosquito buzzing around a few nights prior to the “bite night” so I figured that’s who bit me. The bite was very painful and kept me awake for a good 5 minutes but exhaustion took over and soon I was back to the nice deep sleep. By morning my arm had only a little red bump on it, nothing like that from a mosquito bite. A few days later I was in the bathroom and saw something moving on the floor in a corner. From a distance it looked like a spider. I almost ignored it but decided to take a closer look in case Italian spiders were more interesting than Gringo spiders. And that’s when I met “the mosquito” with long arms and pincers for fingers. I didn’t know what to do with him so I emailed the landlord to ask. Below you will see our email exchange. Read it from bottom to top. 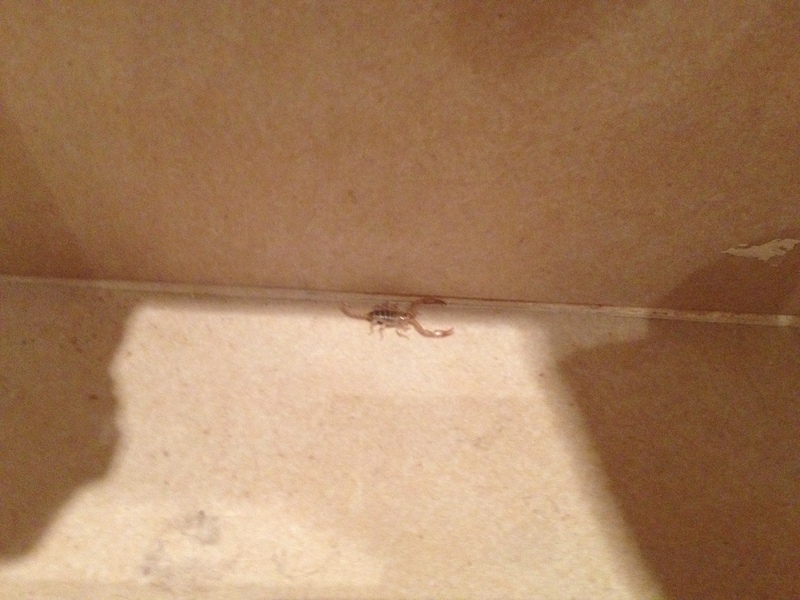 By the way, I researched Italian scorpions and learned that they’re harmless (the landlord was telling the truth), they like to crawl into warm beds with people, and their bite hurts like a bee sting. The strong sting on “bite night” make sense now. >> Can you tell me the address of your apartment? >> The italian scorpions are not dangers. >> I am waiting your answer. Eu amo todos os animais. É difícil explicar o que sinto por eles, mas o sentimento é profundo… e é mútuo. Na presença de animais me sinto mais proxima a natureza e sei que eles sentem a mesma atração por mim. Um dia, eu gostaria de ter um santuário para animais perdidos, feridos ou abandonados. Até lá, vou tentar aprender o máximo que eu puder sobre eles e fará todo o possível para preservá-los em nosso mundo. Durante minhas primeiras semanas em Florença, tive o prazer de hospedar (sem saber) um animal de estimação. Aconteceu numa noite muito fria… estava num sono profundo quando senti uma picada forte no meu braço esquerdo. Lembro que segurei o braço e pensei, “que mosquito poderoso”. Presumi que a mordida foi de um mosquito porque junto aos materiais da escola estava incluido uma lista de itens que deveriamos trazer para a estadia em Florença e, entre estes itens, estava o repellente. O texto dizia que devíamos ter repelente de mosquitos porque os mosquitos são comuns em Florença, mesmo no inverno. Eu tinha escutado um mosquito zumbindo durante a semana então nao me preocupei, mesmo que mordida foi muito dolorosa e me manteve acordada por uns 5 minutos. De manha o unico sinal da mordida era uma bolhinha vermelha no braço, nada parecida com mordida de mosquito. Poucos dias depois da “noite mordida” eu estava no banheiro e vi algo movendo em um canto do chão. De longe parecia uma aranha. Eu quase ignorei, mas decidi dar uma olhada no caso em que as aranhas italianas fossem mais interessantes do que as aranhas da raça Gringo. Foi ai que conheci “mosquito” que tinha braços longos e pinças ao inves de dedos. Não sabia o que fazer com ele, então mandei um e-mail ao proprietário. Abaixo você verá nossa troca de e-mail. Leia de baixo para cima. A propósito, eu pesquisei escorpiões italianos e aprendi que eles são inofensivos (o proprietario estava dizendo a verdade), eles gostam de entrar debaixo das cobertas de camas quentes, e suas mordidas dóem como uma picada de abelha. Então esta explicado a picada forte na “noite mordida”.